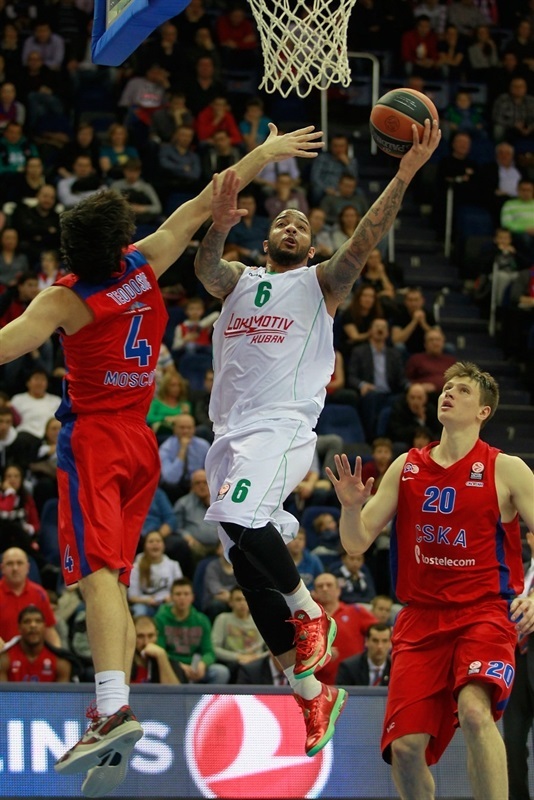 Aaron Jackson came off the bench with 4.4 seconds left to sink the game-winning free throws as CSKA Moscow outlasted Lokomotiv Kuban Krasnodar in a battle of Russian foes at Universal Sports Hall CSKA in the Russian capital. Jackson stepped in for a red-hot Milos Teodosic, who had scored 15 points in the final five minutes before suffering an apparent finger injury when fouled with those 4.4 seconds remaining. 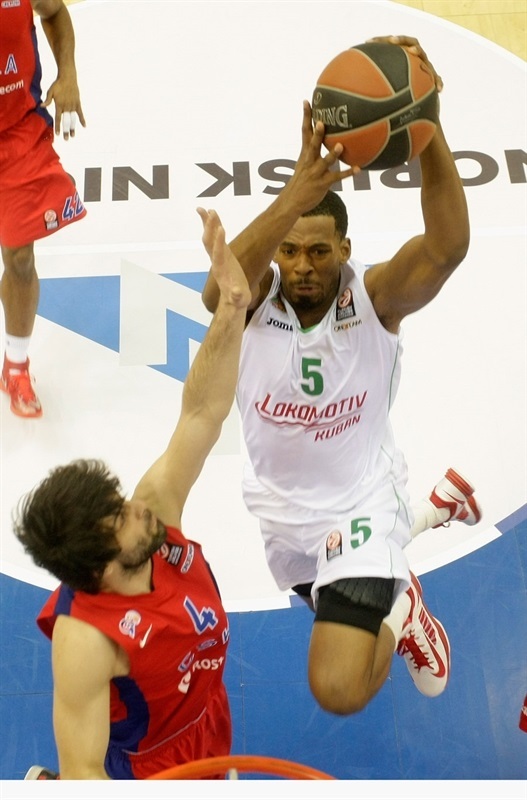 Jackson’s points represented the last of nine lead changes in a thrilling fourth quarter of a game that saw Lokomotiv battle back from a 20-point point deficit. Derrick Brown and Krunoslav Simon highlighted a 1-16 third-quarter charge by the visitors to tie the game and Marcus Williams helped Lokomotiv lead by as many as 5 late before Teodosic stepped up. With the win, CSKA improved to 7-1 in the Top 16 and will remain at least tied for the Group F lead at the end of the round. Lokomotiv dropped to 3-5. 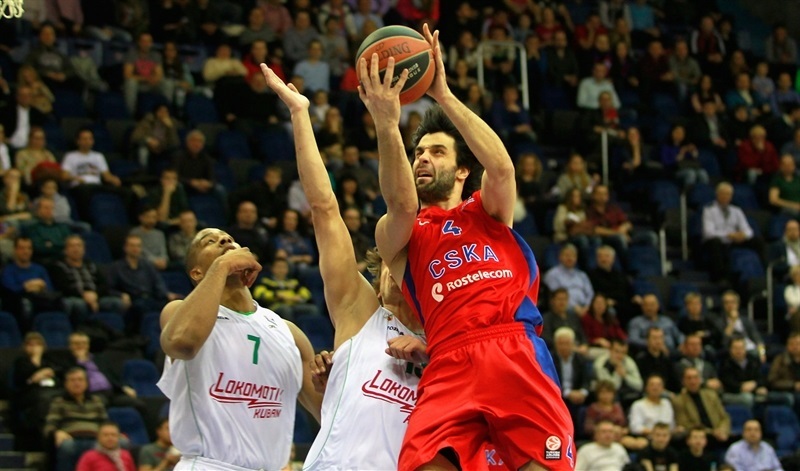 Teodosic finished with 25 points on 6-of-8 three-point shooting to lead CSKA. 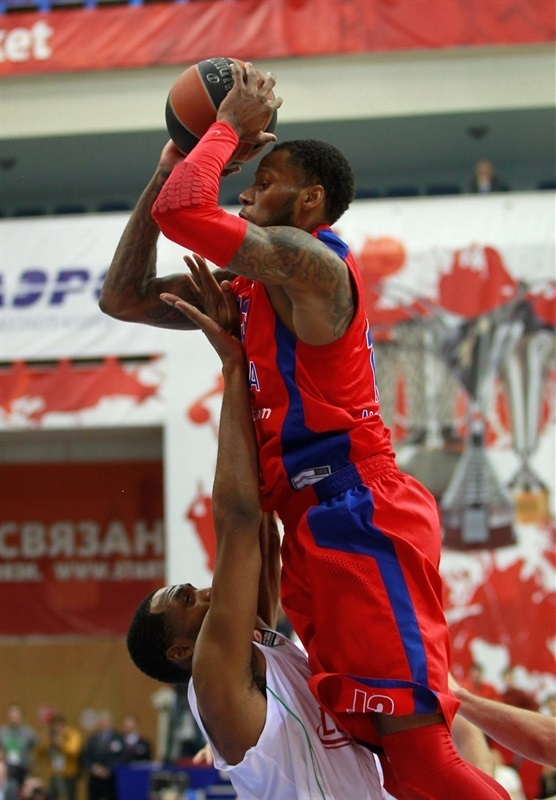 Vladimir Micov added 15 points, Sonny Weems scored 12 and Sasha Kaun and Nenad Krstic netted 10 points apiece. Brown led Lokomotiv with 23 points, Simon had 18 on 4-of-5 three-point shooting, Williams scored all of his 11 points in the fourth quarter and Mantas Kalnietis, Simas Jasaitis and Andrey Zubkov finished with 10 points apiece. Kalnietis also dished 8 assists in defeat. 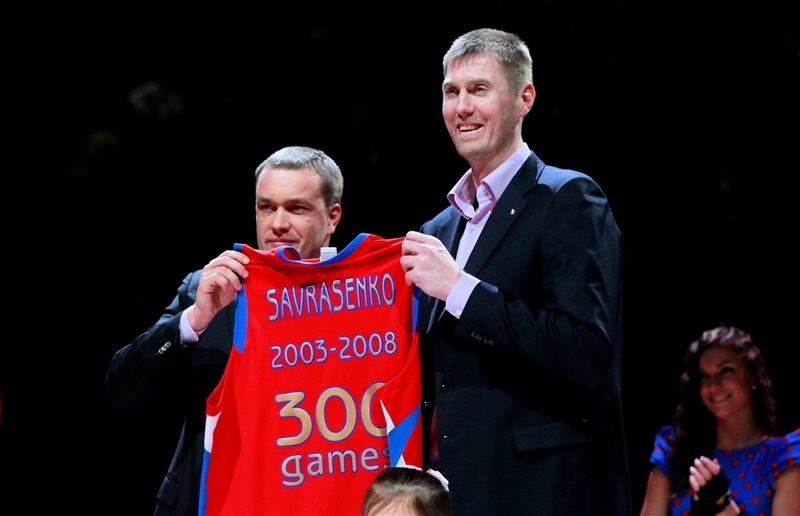 At halftime, CSKA held a special ceremony to honor the recently-retired Aleksey Savrasenko, who won a pair of Euroleague titles with CSKA and won the Eurocup last season with Lokomotiv. Krstic got CSKA going with a free throw and a three-pointer by Jasaitis gave Lokomotiv a 1-3 lead. Krstic hit a jump hook, but Brown followed a power basket with a wild fast break dunk in traffic for a 3-7 Lokomotiv edge. Krstic kept pacing CSKA with another basket and a fade-away jumper by Weems tied it at 7-7. 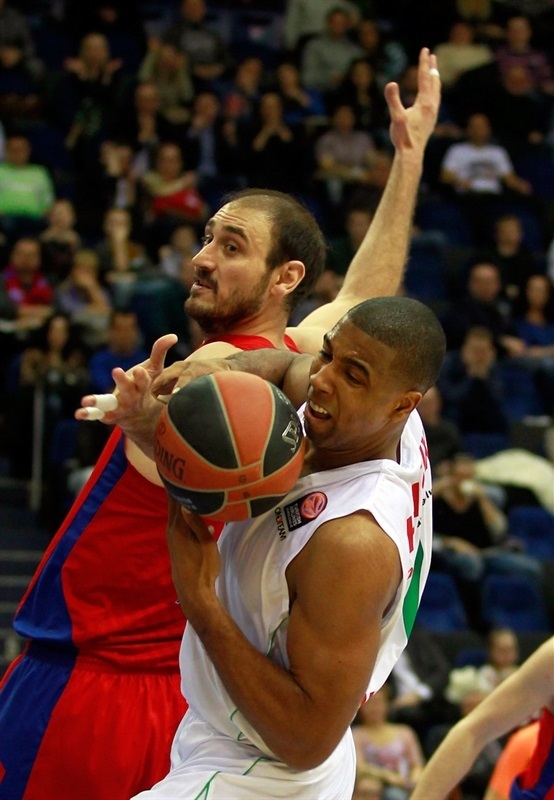 Weems and Anton Ponkrashov exchanged baskets and a jumper by Krstic put CSKA back ahead, 11-9. After Kalnietis scored in penetration, Kyle Hines took over with a dunk and a six-meter jumper by Brown tied the game again, 13-13. Brown dunked again, but Kaun hit a left-handed jump hook and a three-pointer by Teodosic restored an 18-15 CSKA lead. Aaron Jackson shined with a fast break layup. 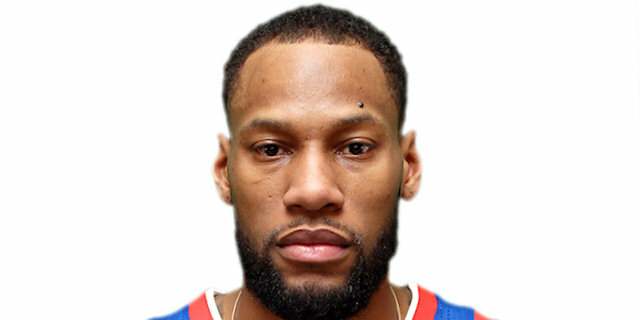 After a timeout, Weems added to his tally before Aleks Maric split free throws to end CSKA’s 9-0 run. However Weems followed with a triple. Simon converted a runner off the glass only to see Sasha Kaun finish a long CSKA offense with a hook shot. Jackson ran the length of the court for a layup just before the first-quarter buzzer to give the hosts their first double-digit lead, 29-18. Kaun hustled for rebounds at both ends and assisted to Andrey Vorontsevich, who split free throws. An active Kaun rejected a shot on defense and Vitaly Fridzon’s behind-the-back pass set up Micov for a triple. Richard Hendrix got on the board for the visitors, but Micov answered with another three as the lead continued to grow. Two more scores for Kaun – the second a wicked two-handed alley-oop throwdown from a Teodosic pass – made it 40-20. Ponkrashov tried to answer, but his basket was met by a Fridzon triple. Simon and Micov traded threes. 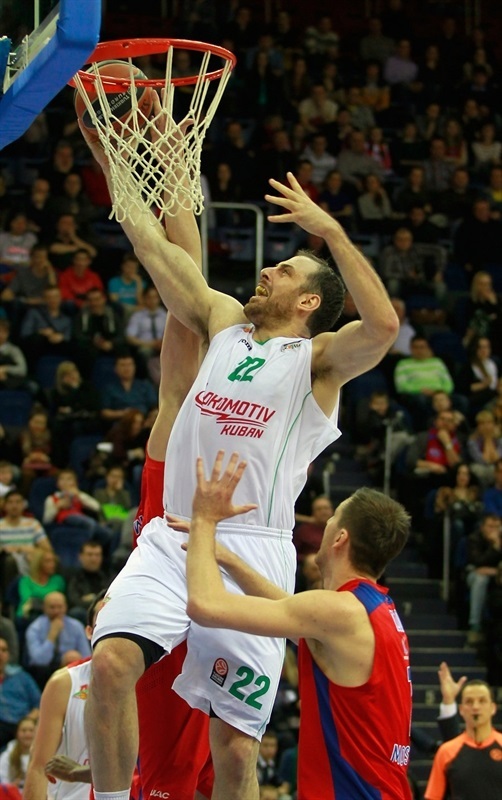 Kalnietis, Maric and Brown came together for a Lokomotiv run. Kalnietis dunked off Brown’s steal, a Maric steal led to a Jasaitis layup and Brown stole the ball and teamed with Kalnietis before throwing down an alley-oop jam, which completed a 0-11 run and carried his team within 10. Hines hustled on the offensive glass for a score. Kalnietis free throws and a put-back slam from Brown made it 48-40 at the break. Jackson used some nifty footwork to get a layup to start the second half. Teodosic sent in a pair of triples as the CSKA lead climbed to 16. Jasaitis nailed a three for Lokomotiv’s first points of the half two and a half minutes into the quarter. Kaun missed a pair of free throws, but in attempting to knock out the second, Brown tipped the ball into his own basket. Lokomotiv stayed close as Brown converted a three-point play and steals by Brown and Simon led to a Brown layup, Simon free throws and a 58-51 difference midway through the quarter. Brown threaded the needle to Jasaitis for a reverse layup before a pair of Simon triples tied the game at 59-59. Krstic split free throws to put CSKA back ahead, but it was brief; Kalnietis fired in a jumper for Lokomotiv’s first lead since the first quarter. The lead changed hands on the next four possessions before a three-chance Lokomotiv possession finished by Zubkov put the visitors up 64-68. Krstic froze Hendrix with a spin move and finished with a slam and Jeremy Pargo penetrated to tie it with a layup, 68-68. Pargo used his dribble to create space for a mid-range jumper that put the hosts back on top. Simon countered with a triple. A Micov layup was again met by a Lokomotiv three, this one from Zubkov. Williams boosted the visitors’ cushion to 72-76, but Weems buried a three with six minutes remaining. On the ensuing play, Williams came through with a pull-up jumper-plus-foul. Vorontsevich sank a baseline jumper, but Williams got back to the line for 3 more points for a 5-point lead. After Teodosic sank free throws, Williams passed back to Brown for a high-flying fast break slam. The difference remained at 5 after Teodosic and Hendrix free throws. Teodosic continued a strong stretch with a triple to make it 84-86 with two minutes remaining. 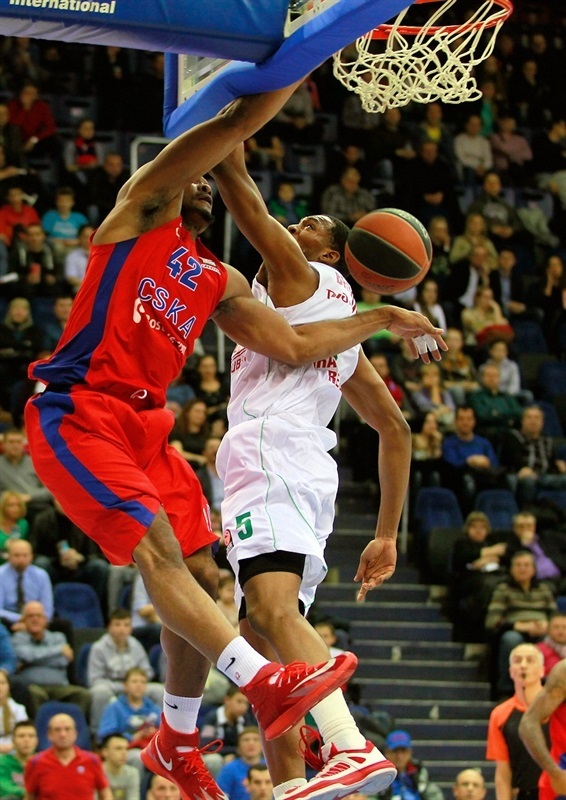 He then put CSKA back ahead with his fifth triple of the game. After a Lokomotiv timeout, Williams buried a three. Teodosic knotted the game at 89-89 with 2 more free throws. 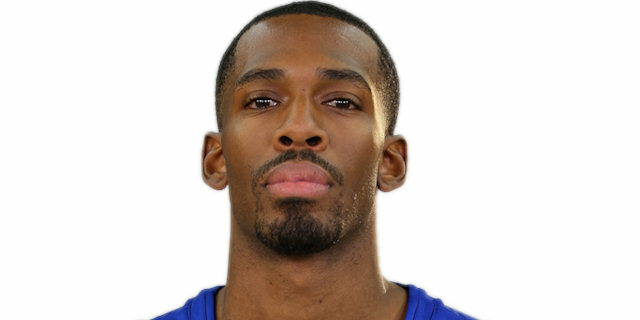 Brown was fouled going for an alley-oop by Hines and made the ensuing free throws. Maric rejected Hines from behind, but CSKA kept the ball and Teodosic sank another three for a 92-91 lead with 45 seconds left. Brown silenced the arena with a spectacular slam over Hines with 9.5 seconds remaining. After a timeout, CSKA went to Teodosic, who was fouled with 4.4 seconds left and seemed to hurt his finger. Jackson came off the bench and sank the game-winning free throws. 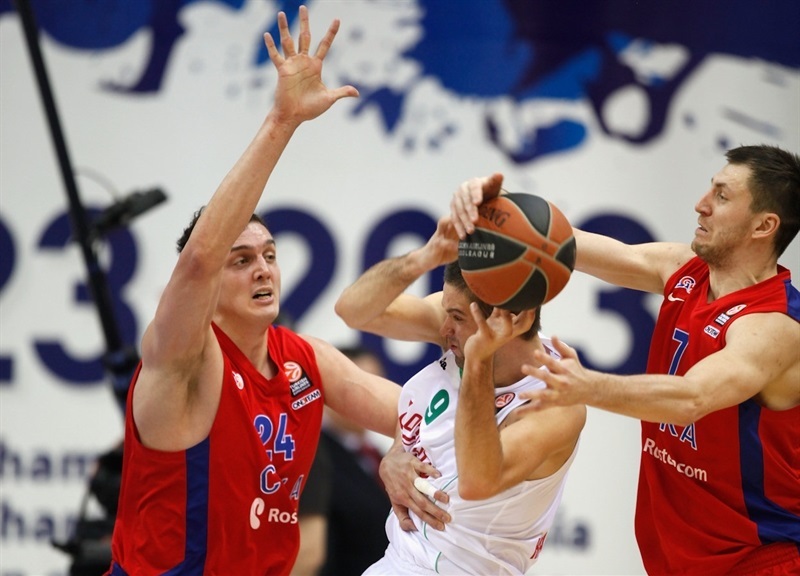 Lokomotiv had one final chance, but Jasaitis’s three at the buzzer bounced out. "It is clear that when you lose big advantage twice – and we were up by 20 in the second quarter and up by 16 in the beginning of the third quarter – it gives you a little bit bitter feeling even after a win. You think that, from one side, Loko played hard, and, from the other side, we played erratic at some point in the game. We made too many turnovers which led to fast breaks and easy points. Fortunately, Teo made some big shots and Sasha Kaun made big defensive plays. Our team played with great focus in the end and at the very important moment Jackson made 2 free throws despite being injured. I think it was a great game for the fans. " "We prepared for the game very seriously and I think we started well. We collapsed in the second quarter, get down by 20 and felt a bit shocked. At the time we did not execute our plan on defense and got lost in our rotation. So the game looked easy for CSKA when we did not apply our best defense. But after that we started to play tough defense, we moved the ball really well and used our smart offense to earn an advantage. We were leading in the end, which is already a big deal when you play CSKA on the road. We tried not to compete in the quick game against CSKA which is a really high-class team and we succeeded. But in the end we made three mistakes: Teodosic made one open three and after that he made two more threes when we got lost on switches after screens. We still organized and Brown made a good play. In the end and we agreed to switch on every screen on our last defense. But Teodosic, who is a first-class player, was able to slip throw two defenders and draw the foul. We know that we have to analyze everything and continue to work hard to try to qualify for the playoffs." "It was a great game. We played a great first half. Then I think we relaxed a little bit. All around it was a good game, but we have to get better, we have to learn how to finish our games. Luckily [Milos Teodosic] made crucial baskets down there and we came down to win. We can’t let that happen again, because we want to be in the Final Four and we are going to concentrate more." "We played hard, but we’ve been in such situations so many times this year when we can’t finish the game. This game was a loss on a record. 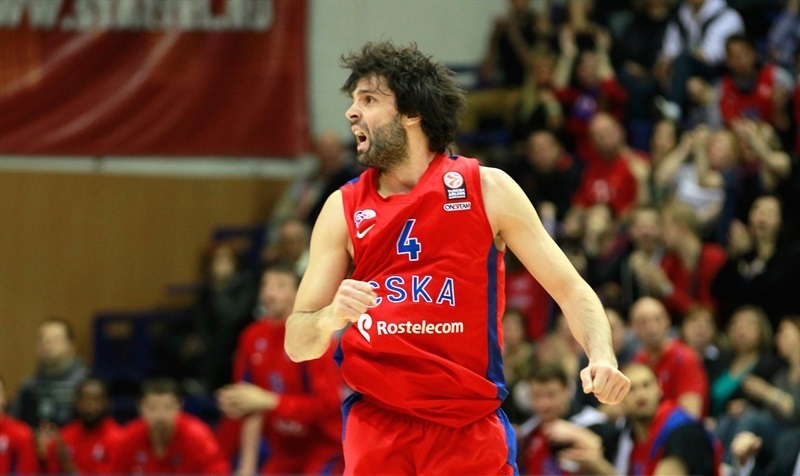 CSKA and Teodosic at the end of the game continued to fight. Hopefully we can learn from this loss and still make the playoffs."